I’m helping newbies learn blender by creating the solar system, including animating the planets orbiting the Sun, and a spaceship that travels around them - 400 frames of animation. 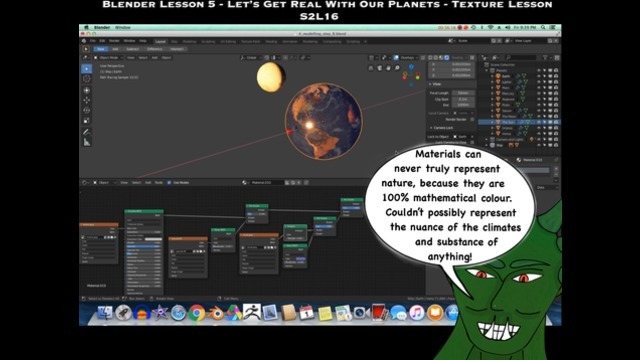 Currently, I’m up to the 5th lesson, which is texturing the planets. 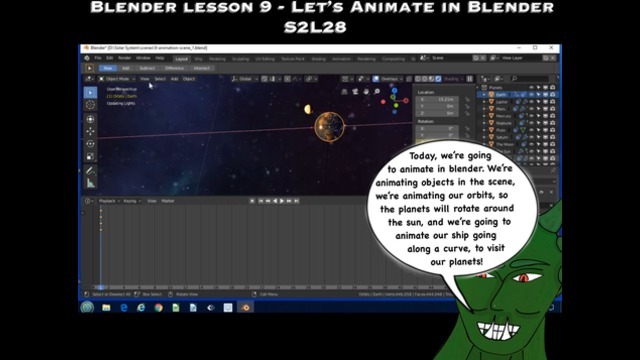 https://www.bitchute.com/video/lZquW1mPKpru/ - Welcome to Blender. 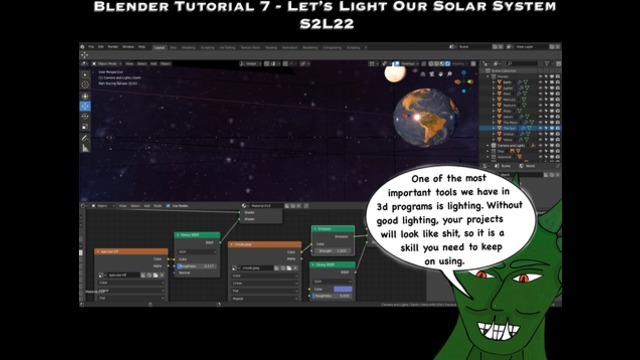 https://www.bitchute.com/video/iUeDcA1Q0llI/ - Let’s Make the Solar System. 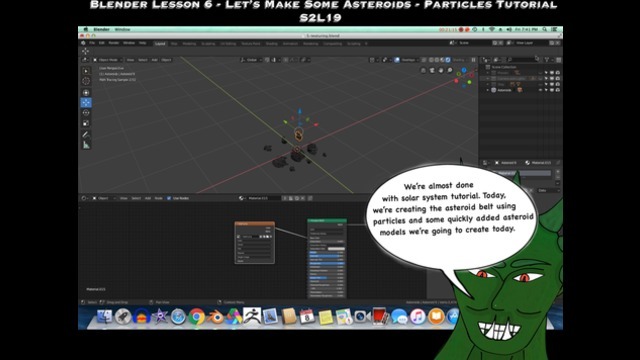 In this lesson, we learn how to quickly model some asteroids using proportional modelling and duplication, and using particles to emit those asteroids all over the place. In this lesson, we talk about what makes great lighting, and then go right into Blender to talk about how they use lighting in their program to create the best light possible. New lesson - Parenting Tutorial. 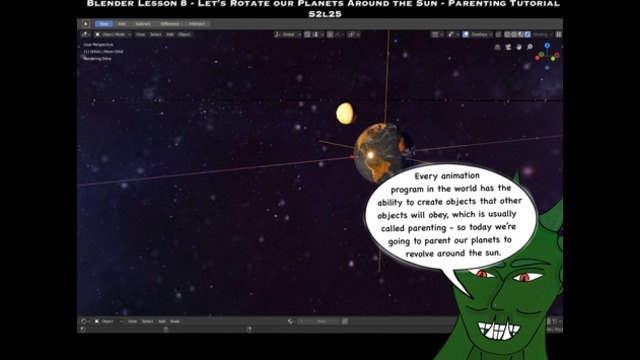 Today, I show how to bring in plain axis to parent the planets too, so you can rotate them and revolve our planets around the sun, and how to do that for the moon around the earth. 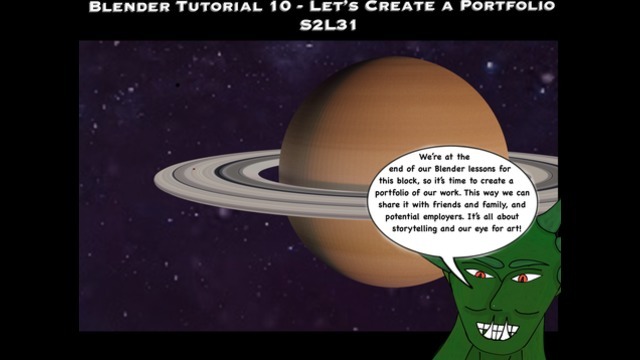 In this lesson, I show three types of animation. First, animating an object - rotating the earth around it’s axis to animate a day and night cycle. Second, using the Plain Axis orbits we created in the last episode, we rotate our planets around the sun to animate the year. 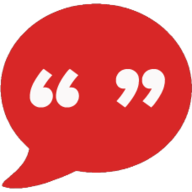 Third, using a Bézier curve, we animate our ship going from planet to planet. We also look at the graph editor to edit the f-curves to make the animations look realistic. Final video in the series. Here I go through how to move the camera around Blender, with the configuration I have created for the Camera - https://www.bitchute.com/video/VIDENczSUojF/ (tutorial here). I talk about composition - lines of force, rule of thirds, and the golden ratio - https://www.bitchute.com/video/BxayP4kkyr4s/ (framing POA video). I also go through the render settings, especially the output settings and file types, and what they are good for. I show my preliminary renders for the different planets, though I expect I will change them up a bit. I hope you all enjoyed this little tutorial series, as much as I had making it. The next tutorial series I am going to start to crack open in blender is character development.